Spasms of Accommodation: Wait, where? Last week I'd never even heard of Morgan City and now I'm staying there. I just got back from a walk along the wharf looking at the big shrimp boats in the Atchafalaya River by the historic district. They have a neat walkway along the top of a big concrete wall that looks like a sound barrier on the interstate. I suppose it's to keep water out, but it has giant openings you can drive a truck through. The fact that they have a historic district must mean it's hard to wash Morgan City out to sea. I'm sure some storms have tried. 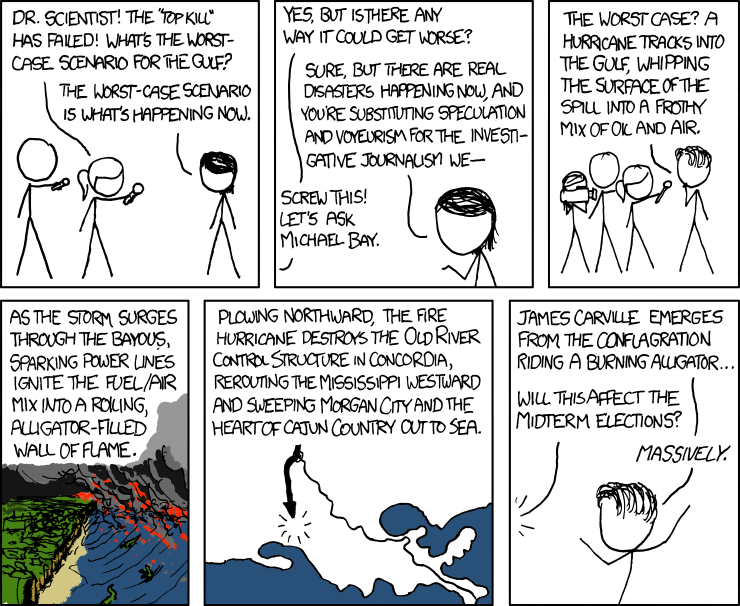 I agree that a storm surge on fire would be a worse scenario, but I don't think it counts if it's utterly implausible. I've been told that weathered oil isn't very flammable. I'm thinking it would be especially hard to get it to burn in the rain. I don't think being a mousse would make any difference. I have no first hand knowledge of this, but I have made salad dressing. Probably more water entrained in there than air. I read an article online that said they've got some fluffy tarballs over in Pensacola today. Wonder if anybody has tried to set one on fire. There were strong thunderstorms all day today so I didn't get to go on an airboat. Will try again tomorrow.